This is the third in a series of posts on the revelation of Jesus' redemptive work on the cross in the ancient Hebrew/Semitic pictographs that make up key words and phrases in the Bible. In the first post, My Covenant, I showed where Jesus is revealed the first time God uses the phrase "My covenant" when speaking to Noah. The second showed how Jesus was revealed in the first Hebrew word in the Bible, "Barasheet" (In the beginning). In this post, I will explore the word "Hebrew" (or, "Ibrit"). As discussed previously, the Hebrew alphabet is derived from an ancient Hebrew/Semitic alphabet made up of a series of pictographs. The word Hebrew (Ibrit) is comprised of the Hebrew letters AYIN (similar to, though not the exact equivalent of, our letter "E", "I", or "O")(the ancient pictograph for AYIN is an eye, and its meaning is to see). BET (B)(pictured as a tent or house, meaning house, as in a lineage). RESH (R)(pictured as a man's head, meaning the first or highest person). YOD (Y)(pictured as an arm from the fist to the elbow, meaning my hand/works). TAV (T)(pictured as two crossed sticks, meaning a covenant or mark). Recall from My Covenant that the Hebrew word b'rit (spelled BET, RESH, YOD, TAV) is "covenant". So, the word Hebrew (or Ibrit) can be read TO SEE the COVENANT. 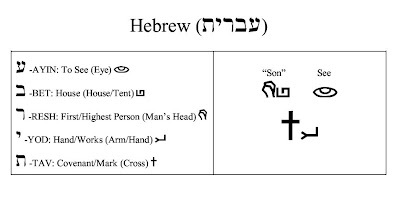 Moreover, covenant (b'rit) is pictured as the SON (recall that the Hebrew/Aramaic word "bar" spelled BET RESH is "son") with his HANDS on the CROSS. In short, within the very word Hebrew (Ibrit), God has shown that we will SEE the SON with his HANDS on the CROSS, and SEE that as His COVENANT. Whether in the first word of the Bible (also the "word" or "covenant" of God), or the first time God speaks the word covenant, or within the very name of the language originally used to give God's word, the message is the same: Jesus is God's covenant. Here is the word Hebrew (Ibrit) in the ancient Hebrew pictographs.